Find out everything you need to know on the new BMW X1 from independent vehicle review website Car And Driving. You can watch the video review to the left to see more of the car or read their written review below to get a true insight from an expert in the automotive industry. The X1 is BMW's premium compact Crossover model and it's been much improved second generation guise. The version most will go for is the xDrive 20d diesel we're trying here. Jonathan Crouch finds out why. 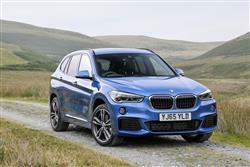 One in every ten BMWs sold is an X1 and that figure's set to rise as the family Crossover segment continues to grow. This MK2 model aims to capitalise on this sector's popularity, providing potential Qashqai-class buyers with a premium-badged option that's now a far more credible choice. BMW created the original X1 from various bits borrowed from the rest of its product line-up, but this second generation version is freshly designed from the ground up with much more space, sophisticated underpinnings and a hi-tech engine range. It's a strong contender, especially in the volume xDrive 20d diesel guise we look at here. Today, it's hard to imagine a BMW line-up without an X Series range of performance-minded SUV models. The Bavarian brand calls these 'Sports Activity Vehicles' and they now account for over a fifth of the company's worldwide sales, with the starting point of the line-up the model we're going to look at here - the vastly-improved second generation X1. Clearly this is a car provided to get customers onto the first rung of a ladder that the Munich maker hopes will lead on to ownership of larger and faster X3, X5 or even X6 models. But it's also there to give BMW something that its larger Audi Q5-sized X3 design is too heavy and expensive to deliver: namely, entry into the world's fastest growing automotive market segment - that for Qashqai-class Crossovers. This MK2 variant will better suit this sector, courtesy of a hi-tech UKL chassis borrowed from the MINI Hatch that provides the perfect platform for a considerably more sophisticated X1. This car is smarter and more efficient, plus we're told it's got better driving dynamics and much higher build quality. In short, it claims to have been rejuvenated. Time to try it in volume xDrive 20d diesel form. On the move, this second generation X1 feels quite different from its predecessor, with a higher-set driving position that's less sporty but more commanding than before. All the key elements are in place for a decent driving experience and there's a 'Drive Performance Control' vehicle dynamics system that, via three main modes, 'ECO PRO', 'Comfort' and 'Sport', allows you to tweak throttle response, steering feel and stability control thresholds. Gearshift timings too if you've opted for the 8-speed automatic gearbox that we think many X1 buyers will want. We tried the xDrive 20d diesel model that's only offered with 4WD. This on-demand system gives you just enough traction for icy days and muddy tracks. You shouldn't attempt much more than that given the modest 183mm ride height. This variant uses BMW's familiar 2.0-litre TwinPower diesel unit in a 190bhp state of tune, enough to offer 400Nm of torque and thereby sufficient to enable this variant to tow up to 2 tonnes, should you need it to. In an xDrive 20d X1, you'll make 62mph from rest in 7.6s en route to 136mph if you're quick with the slick-shifting 6-speed manual gearstick, but should you want to go faster, there's a pokier 231bhp xDrive 25d variant that improves those figures to 6.6s and 146mph. Here's a much bolder and more confident X1, with a street presence vastly different to the rather apologetic look of its first generation predecessor. Inside, one of the first things you'll notice is the way that you're seated 30mm higher this time round, creating a much more SUV-like feeling of roadway command. Look around and the high quality layered fascia is much as it is in the other BMW that shares this one's MINI-derived underpinnings, the 2 Series Active Tourer. Time to take a seat in the back, with access into the rear cabin now much easier thanks to much larger door apertures. And once inside? Well it's back here that you really notice the benefit of this MK2 model's extra 90mm of wheelbase length - and the way that the seats are positioned 64mm higher up to give you a better view forward. The designers claim that there's an extra 37mm more kneeroom this time round, a figure you can extend to a limousine-like 66mm if you pay extra for the sliding rear bench which offers 130mm of back-and-forth adjustment. Out back, once the powered hatch rises, you're provided with a class-leading 508-litre space, which means there's 85-litres more than the previous model could offer. This second generation X1 range is priced between £27,000 and £36,000, with the mid-range xDrive 20d model we're trying here - the one most buyers will want - needing a budget starting from just over £32,000, about the same as you'd spend on a 4WD 320d version of BMW's 3 Series Touring estate. Overall, we're talking of figures that see this second generation X1 pitched a little more expensively this time round. Standard equipment includes 18-inch alloy wheels, front foglights, an automatic tailgate, Park Distance Control rear parking sensors, heated power mirrors, roof rails, an alarm, auto headlamps and wipers, a chrome-finished exhaust pipe, plus matt silver front and rear underbody protection panels. Inside, the 40:20:40 split-folding rear backrest is standard-fit, plus there are niceties like two-zone automatic air conditioning, 'Comfort Go' keyless engine start and the 'Drive Performance Control' vehicle dynamics system. Other standard items include a 'Sport' multifunction leather-trimmed steering wheel that features controls for the decent quality six-speaker 'Professional' radio set-up with its DAB tuner, CD player, USB and Aux-in interfaces and audio streaming features. You can also oversee the stereo via the 6.5-inch colour screen and rotary controller of BMW's intuitive iDrive infotainment system. This also deals with Bluetooth 'phone functionality and the standard Navigation system that some rivals will make you pay extra for. Time for some detail on this car's class-leading returns. If you're looking at the 190bhp xDrive 20d derivative we're trying here, then you can expect 57.6mpg and 128g/km. Or, to put it another way, you can expect to be able to go around five miles further on every gallon that you would in a directly comparable Audi Q3. Plus there's almost no efficiency downside if you want to opt for the extra power of the pokier 231bhp xDrive 25d X1 variant, this automatic-only model managing 56.5mpg and 132g/km. What else? Well as usual with a BMW, there's a condition-based service indicator on the dash to advise you when your car needs a garage visit, but new to me was the clever 'TeleServices' feature that comes as part of the BMW 'ConnectedDrive' services you can access through the iDrive infotainment system. Via this, before each service appointment is due, your X1 can put in a 'TeleServices' call to your nominated BMW service centre, complete with detailed information on vehicle condition. On to the warranty package. BMW offers a warranty that lasts for three years, no matter how many miles you complete. As for insurance groups, well you're looking at group 30E for this xDrive 20d variant. BMW needs this car to be good. In its original form, the X1 was a niche player, but for this second generation version to be considered successful, it must become one of the most popular cars that the Munich maker sells. And we think that's just what might happen. For most buyers, one of these would make far more sense than BMW's comparably-sized 3 Series Touring - and there aren't too many reasons to pay more for the Bavarian brand's larger X3 model either. As for appeal within this X1's market segment, well it's more practical, slightly cheaper to run and classier to sit in than Audi and Mercedes rivals who really now have a fight on their hands in taking on this car.